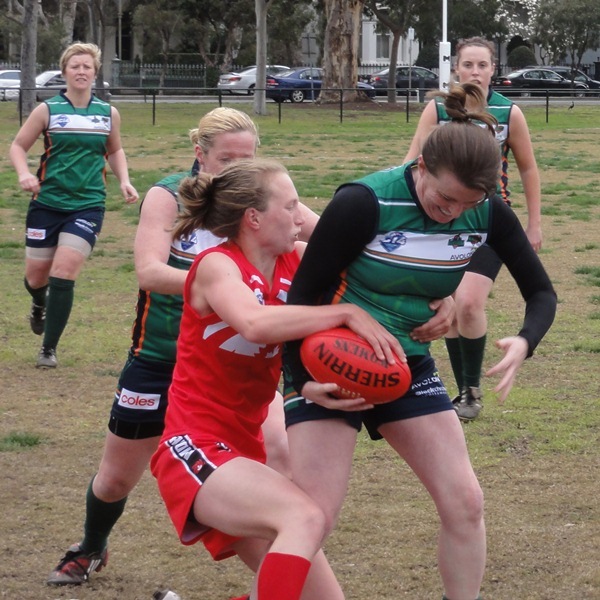 The Midnight Suns came into this game with one win against the lossless Banshees. They were certainly taking this game seriously. Breaking into 3 player groups well before the obligatory warm-ups. The Irish were looking confident and targeting a good lead up performance for the finals. The Banshees were immediately into attack for a minor score. The resulting kick out was marked and free kick on the point post resulted in a good goal from the angle. The Irish were dominating, stringing together good passages of play with a free kick at the end producing another goal. They were unlucky not to repeat the result immediately after. #20 Veronica Fernandez for the Suns was trying to slow the Banshees down and mount an attack. A mark to her and a pass to #18 Lisa Della Rosa resulted in a Suns goal. Canada again broke into three groups for some wise words at the break. With the use of strengthening breeze they could build on the good work of the latter half of the quarter. But again it was the Banshees starting strongly. #25 Louise Loughlin marked well. Her shot fell short only to create an opportunistic Irish goal. Shortly after she again marked, ran on, executed the 1~2 and kicked truly from distance. #28 Rachel McCann snapped opportunistically from a long handball coming out of a defensive pack. Again The Suns had to regroup but it was always hard against the weight of the Irish pressure. 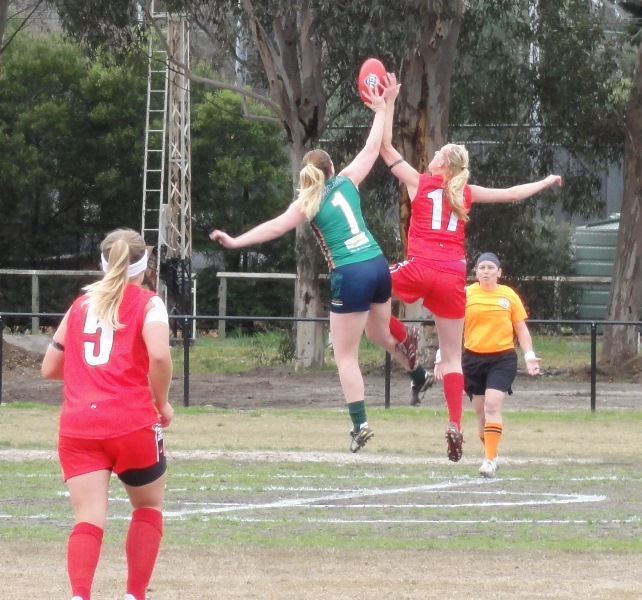 However #17 Meagan Lowden worked in the ruck and #7 Justine Stevens took some defensive marks. The Midnight Suns worked as a team and scrambled a much needed goal. The wind re-freshened for the aid of the Banshees so the Suns had it all to do in the third quarter. They worked really hard playing some structured football held together by #20 Veronica Fernandez taking marks and solid ground play. Some high kicks into the breeze didn’t help their cause. The Banshees meanwhile, while challenged always had the answers. In fact in inaccuracy cost the Banshees the opportunity put the result beyond doubt. It was a pity that the gap in the scores was so large because the Suns provided a real contest. Initially it was the Banshees into attack. #20 Ua McKay , #11 Laura Corrigan , #28 Rachael Mccann and #3 Paula Keatley forming a wall forward of centre constantly creating scoring opportunities. It was to the Suns credit that these were limited to two points. Having weathered the storm and taking notice of intensive third quarter coaching the Suns opened up and played some quality football. 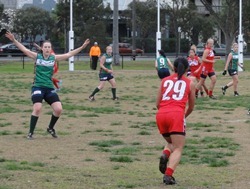 #20 Veronica Fernandez was providing drive around the ground. There was a drive from half back and kick to #20 Veronica Fernandez resulting in her taking possession, running, bouncing and getting her kick away before being tackled late. Unfortunately she pushed the kick wide which would have meant a Sun’s win for the quarter. It was a good lead up to the finals by the Banshees ironically provided by the competitiveness of Canada’s “B” team.